This humble tofu dish will surprise you. It's very delicious. You'll easily find it served in Chinese restaurants. Now you can make your own at home in just 15 minutes. Salt and pepper are great partners as seasonings. I have made different Chinese dishes with salt and pepper, like prawns, chicken wings, quails, pork chops. All these dishes are simple and delicious. These two humble condiments, salt and pepper, are very versatile, not only going so well with meats, but also tofu. You can’t imagine that a bit of salt and pepper will turn the blank tofu into amazingly tasty food. This dish is often served in Chinese restaurants. The chefs often use deep frying method. As I tend to use less oil in my home cooking, I pan-fried the tofu instead, followed by stir frying and mixing with other ingredients. It’s very easy and straight forward. 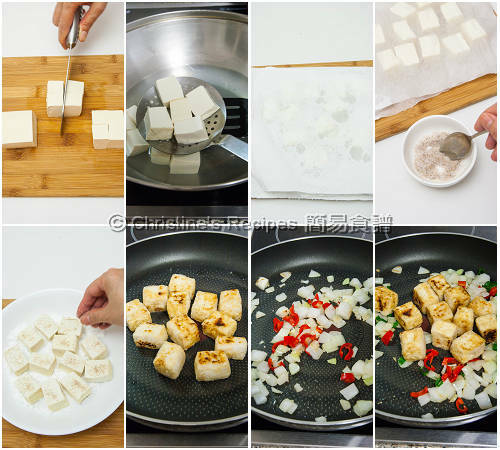 Cut tofu into smaller pieces. Blanch in salted water for 5 minutes. Carefully drain and wipe dry with kitchen towel. Mix all the ingredients of seasonings well. Sprinkle a bit of the seasoning mixture, not all of them, on both sides of tofu. Beware not to sprinkle too much. The tofu will turn black if too much five-spice powder on the surfaces. Lightly coat with potato starch. Heat oil in a frying pan over medium high heat. Fry the tofu until the sides turn lightly brown. Set aside. Add some oil in the pan. Saute onion until aromatic. Push to the sides of the pan. Saute garlic in the middle. Add red chilli. Toss back the tofu. Sprinkle wine. Pour in soy sauce and stir in the remaining seasonings. Stir to combine. Add spring onion. Serve hot. 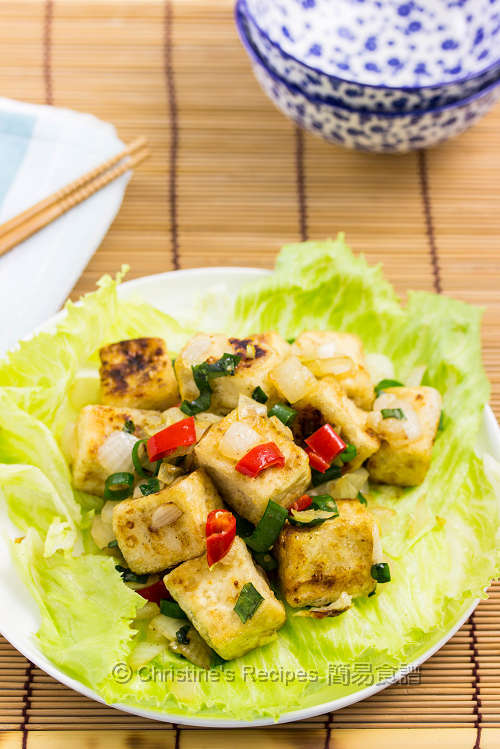 After blanching the tofu in salted water, they won’t release excess water while frying. The heat level of red chilli is very different from type to type. If it’s deseeded, the heat will decrease. 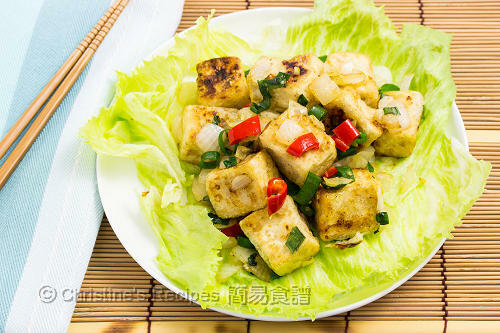 By coating the tofu with potato starch, it turns crunchy after frying. If you don’t have potato starch, you can use corn flour / corn starch instead. Love salt&pepper tofu! This is so delightful and tasty, Christine. I love salt and pepper tofu, and it's fantastic that you used less oil with panfrying.